Songtham Kaewpanpruek, 24 years old, ex student of Ratchamongkol Suvarnabhumi University and a member of Thai Student Center for Democracy (TSCD). Abhisit Sapnapapan, ex student of Kasetsart University and a member of Serinonsi Kasetsart, he protested against autonomous university and the construction of “Mae Wong” dam. He also called for responsibility of the government on disappearance of Billy, a tribal activist for Human Rights. 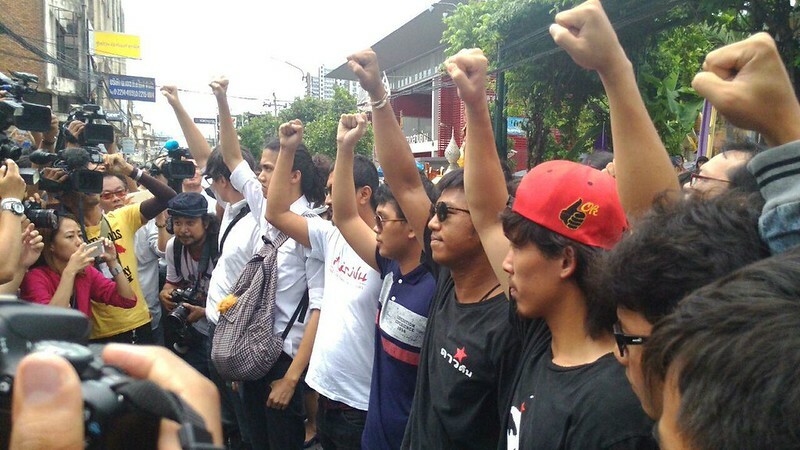 On 22 May 2015, all of 9 activists and others, together 37 people were arrested, after attending an activity called “Look at the clock” for the 1st year commemoration of the coup, in front of Bangkok Art and Culture Center (BACC). Later, all 9 activists were alleged for violating the NCPO’s Order No. 3/2015 which prohibit political gathering more than 5 persons. On 22 May 2015, the police put the iron fence in front of BACC before the activity started. When activists gathered at the path way in front of BACC, police were already prepared inside the fence line. The police, with and without uniform, did not arrest all of activists at the same time, but they opened the fence, dragged and pulled sets of activists and took them inside BACC, one set included 4-5 activists. After the arrest, the police came back to wait for new sets of activists and arrest them with the same method. Some of activists were arrested while they were trying to enter the fence in order to help their friends who were arrested before. Some activists claimed that they were also assaulted from the police during the arrest. After the activity finished, it was reported that 37 activists including these 9 accused were taken to Pathumwan police station. At around 6 PM, groups of activists made an appointment in front of BACC to do a symbolic activity called “Look at the clock” for the 1st year commemoration of the coup. The police forces surrounded the area since before the appointment time. When activists appeared, the police asked them to disband. When activists rejected to do, the police orderly arrested the activists by coming out of the iron fence and fought with them, took them to BACC, 3-4 persons per one arrest. Some activists who obsturcted were dragged and pulled on the floor. Sometimes the police sent representatives to negotiate with activists. But the arrest keep continueing as before. At around 7 PM, at least 38 activists were taken to BACC. Some activists who were not arrested decided to follow the arrestees to Pathumwan police station. The activity was finished at around 7.30 PM. At Pathumwan police station, staff of Judge Advocate, police, Prinya Thaewanarumitkul and Theera Sutheewarangkul lecturers from Thammasat University negotiated with students who were arrested. The police informed that they would announce the offence and charge 8-9 activists, the rest of activists will be released. But the activists did not accept that because they came together they must go back home together. Meanwhile, around 100 people were gathering and calling for the release of all activists without conditions. At around 2 AM, Theera Sutheewarangkul informed the group of people that the police will not charge the activists. They will check their profiles and release everyone. If someone has illegal record, they will charge and prosecute them later. The investigation was held until 6 AM of 23 May 2015. Then all activists were released. However, during activity and arrest, there was the news spreading through social media that some of students were attacked and injured. It was found that, Songtham, one of the members of TSCD was injured during arrest. He was laying down in injured condition in BACC for 2 hours before the ambulance came to take him to Huachiaw hospital. Preliminary, he had wounds at his eyes, red bruise at his neck, chest and arms. The pain at his chest caused him hard breathing. His eyes were swelling and he couldn’t easily open his eyes. The doctor checked and found that he was safe but he should stay at the hospital to be observed more symptoms. Besides, when all activists were detained at Pathumwan police station, at least 2 activists had injuries. Natchacha Kong-u-dom, a student of Bangkok University was injured from drag and pull during the arrest. At police station, she felt queasy and threw out many times. Then she was taken to Phayathai 1 hospital. The doctor checked and allowed her to go back home but she was taken to Pathumwan police station again. At around 1 AM, Chonthicha, a student of Srinakarinwirot, felt dizzy and fainted down. It was assumed that she was clashed during the arrest, besides, she also has congenital disease. The police spent 1 hour for calling ambulance from Erawan Center to pick her up. She was sent to Huachiaw hospital, after getting injection, she was taken back to Pathumwan police station again. Police summoned 9 activists to report themselves later for accepting the charges. But 7 of them announced to the public that they will report themselves on 24 June 2015. Thatchapong and Natchacha went to report then the police seperated their case. Prachatai reported that Thatchapong, one of 9 activists who got warrants, along with Puangtip Boonsanong, his lawyer, went to surrender with Pol.Lt.Col. Suriyamet Pakdiwiwat, an inquiry officer of Pathumwan police station, in order to accept the charge. The police spent more than 3 hours for investigation. Puangtip revealed that Thatchapong surrendered on that day in order to fight the charge in the procedure. They prepared about 20,000-50,000 THB cash for bail depending on how much the military court needs. Puangtip also revealed that even if Thatchapong did not involve with the gathering, he wanted to prove himself to the court that he did not flee and still came to report himself according to the warrant for the process of judgement. After an investigation, the police informed the charge “political gathering of more than 5 persons" for Thatchapong, and then they sent him to military court to continue the process at 1.30 PM. At around 4.30 PM, Bangkok Military Court issued the order to bail Thatchapong out with cash 10,000 THB under conditions that he must not gather and express his political opinion. Thatchapong was released at the evening of the same day. 8 activists annouced to filed a complint against police who violently assaulted them at Pathumwan police station. About 100 police from Pathumwan police station were training at in front of BACC at around 9.30 AM to prepare for prevention. Meanwhile, in front of Pathumwan police station, there were many police and military officers with and without uniform prepared the force and put iron fence for prevention. At 1 PM, 'Daodin' activists and 7 activists who got warrants, except Natchacha whom was arrested in the same morning and Thatchapong who met inquiry officer before, came to Pathumwan police station. There was a group of people coming to give encouragement. The group of activists pointed out “Today we do not come to report ourselves, but we will report that we were attacked by the police” after that they let their lawyers represent them to inform in police station. Pol.Lt.Col. Rungroj Putthiyawat said that they could not allow the lawyers to file a complaint on behalf of the students because the students had come to police station already, they should go into the police station by themselves one by one. The activists rejected the proposal and requested the police to set a desk to receive the complaint in front of Samyan market, which was the place where the activists and people gathered, by 3.15 PM, if not, all of the people would go inside the police station. At around 3.30 PM, Col. Burin Thongprapai came to Pathumwan police station with the arrest warrants for Daodin activists. At 4 PM, activists and the people who came to support lined up and walked up to police station but they could not access so they waited in front of the police station. Ketsarin Tiewsakul, an officer of National Human Rights Commission (NHRC), together with some scholars such as Puangthong Pawakarapan, some activists such as Rangsiman Rome, negotiated with Col. Burin Thongprapai. At 6 PM, the negotiation brought the conclusion that the activists who wanted to file a complaint could do it without being arrested or getting charge. But they had to disband after that. At 8.30 PM, Daodin members tried to get into Pathumwan police station in order to check the warrants. They also told the police that, if they are not allowed to access the police station, the warrants should be shown at least, and they want to know the result by 9 PM. At 9.30 PM, 5 activists, together with their lawyers, who reported, came out to tell other activists and people in front of Pathumwan police station that they have filed a complaint already. At around 9.50 PM, the gathering was completely disbanded. After finishing gathering, it was reported that, 7 Daodin members took a taxi of Mr. Pansak Srithep, an activist of Resistant Citizen, and were followed by many the plaincloth police with motorcycles. Songtham, one of 14 activists, was arrested at Don Muang Airport after getting back from Malaysia since the immigration officer found that he has got a warrant for violating the NCPO’s order No. 3/2015. The warrant was issued after Songtham and some activists had done Civil Disobedience by not going to meet inquiry officer according to the schedule. After being arrested, Songtham was taken to Pathumwan police station which is responsible for the incident around the local place (BACC). Because Songtham was arrested in the middle of the night, he needed to sleep in the cell of police station for one night to wait for an inquiry officer in the next morning. At around 9 AM, inquiry officer interrogated Songtham and informed the charge of violating the NCPO order no 3/2015 as political gathering. Songtham denied the charge and requested to bring it to court. The inquiry officer made an appointment for Songtham to meet again on 16 September 2015 to send him to attorney and then they released Songtham without bail at around 12 O’ clock. Bangkok Military Court scheduled with Pornchai for deposition examination and to hear the court order about permission to go abroad of Pornchai. Before this, Pornchai went abroad to study since 11 July 2015 and came back to visit his family on 8 December 2015. Later he got an order requiring him to meet with staff of judge advocate. He went to meet and made a request for bail on 29 December 2015, the court approved the bail with cash 20,000 THB with the following conditions; 1) do not attend political gathering 2) do not incite the public 3) do not go abroad. The last one was the reason for him to request the permission for going abroad. At around 10 AM, at court room no. 1, the military judges appeared on the bench, read the indictment and made inquiries for Pornchai. He rejected all charges. After that, the military prosecutor requested for witness hearings and combination of this case with Natchacha and Thatchapong’s case, as all 3 persons, together with other 6 friends, who were not charged yet, had done the offence according to the charge and they have the same evidences for these case. Natchacha and Thatchapong’s case is on the process for final decision on the jurisdiction of the court. However, Pornchai did not oppose about combining his case with another case. For Pornchai’s request to go aboard, the court approved it because it was reasonable, but Pornchai must come to the court on the schedule evey time. Abhisit and Pakorn attended the activity called “Just Standing” with Resistant Citizen at Victory Monument demanding the military to release 8 people arrested at the morning of 27 April 2016. After the two had finished “Just Standing” at around 6.10 PM, the police took them and other activists to Phayatai police station, 16 persons in total. After that, at around 10.30 PM, the two were sent to Pathumwan police station because there were warrants on gathering for 1st year commemoration of the coup on 22 May 2015. 3 members of New Democracy Movement including Rangsiman, Ratthapon and Chonthicha also went into the police station in order to hear what police want to do to them. All 5 confirmed that they would not request for bail and give any information. After a discussion, police officers informed the charge and released all 5 without bail and made appointment between them and prosecutor on 11 May 2016.